Van Nuys High School Class of '69 - 50th Year Reunion is On! 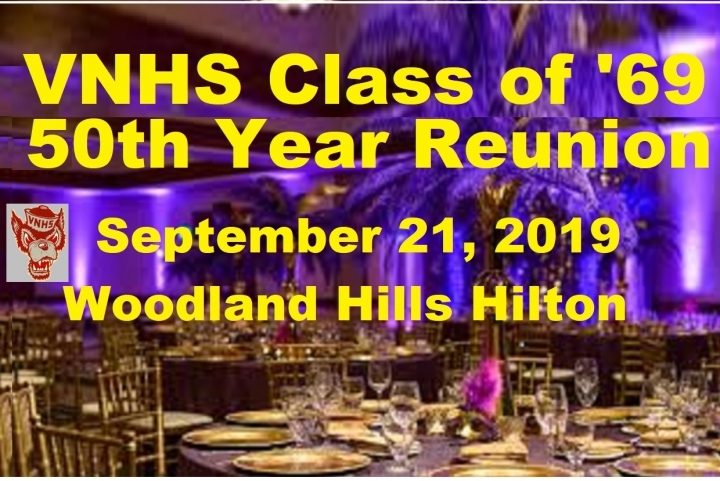 Saturday Sept 21, 2019, Woodland Hills Hilton Hotel. Please contact http://reunioncommittee.com/ for all info. Rescheduled for 9/21/2019. The October date is not the current info. 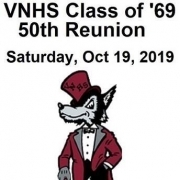 Van Nuys High School Class of '69 - 50th Reunion is On! Saturday Oct 19, 2019, venue will be close to the Van Nuys Airport. More information to follow soon. In the meantime feel free to send me a fb request Angel Canete (SonySalsa), or email angel@highpalms.com to stay in touch. The class of 1969 experienced history on a regular basis: The Summer of Love, the Tet Offensive, Nixon's rise to power, The Beatles' creative peak... very few spans of time can claim to have shaped American culture as much as the late 60's, and you & your Cory-Rawson classmates experienced it together. Now as you and your fellow Wolves prepare to enjoy retirement it's the perfect time to reunite and share where life has brought you in the last five decades. AlumniClass.com (5899) - 10019 E Knox Ave, Spokane Valley WA, 99206.